Perfect for the larger garden the 14'8" wide Renown gives you maximum growing space. Made from robust aluminium with extremely strong box section glazing bars, this greenhouse has been designed to last a lifetime. Each Robinsons Renown comes complete with 4mm toughened safety glass which is 5-7 times stronger than standard horticultural glass. Guttering and downpipes are included to collect precious rain water - which will be well used in a greenhouse of this size! The automatic roof vents react with heat to open and close throughout the day. With 4' wide double locking doors, you can easily use wheelbarrows and wheelchairs. 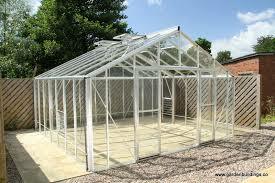 We have a large range of optional accessories so that you can tailor your greenhouse to your exact requirements. You can opt to have staging and shelving to give you a robust work space and growing area. Attractive ridge cresting and finials not only create a decorative finish, but can also stop birds from making a mess on your roof! You can even add even more ventilation should you need to with louvre and roof vents. As with all Robinsons greenhouses, the Renown can be adapted to sit on a dwarf wall at no extra cost. Simply let us know when you order your building and will provide drawings and plans so that you can build your wall (materials for the dwarf wall are not supplied).